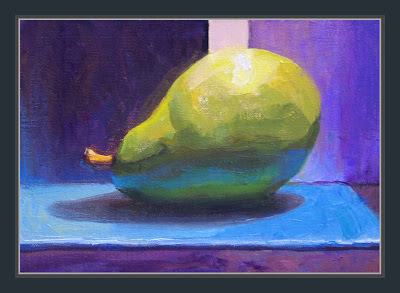 Pear Glow - There is an uplift to the pear by the radiant light. This is a delight in just so many ways: color, design, brushwork... I feel like I went to a party after I look at this. I adore that pinkish stripe on the rear wall. Dan, it seems like the pear is doing a little jig - maybe a break dance! It's awsome! You're getting some great color here. Nice work. Nice observation - the blue reflecting back up on the pear. . . .